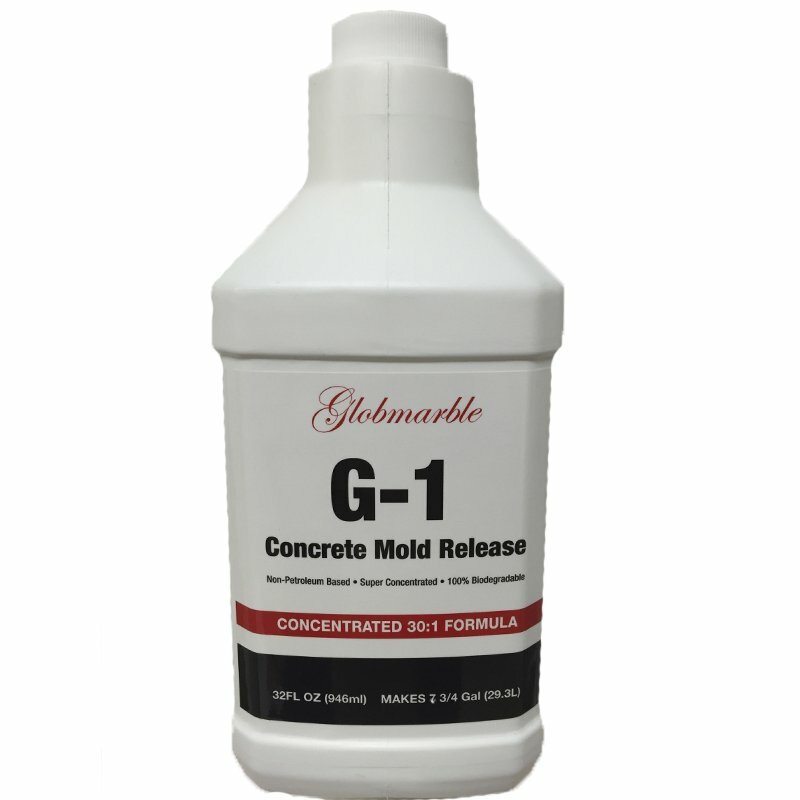 Our Concrete Mold Release soluble concrete release agent will aid in releasing concrete or gypsum plaster castings from GlobMarble rubber molds. 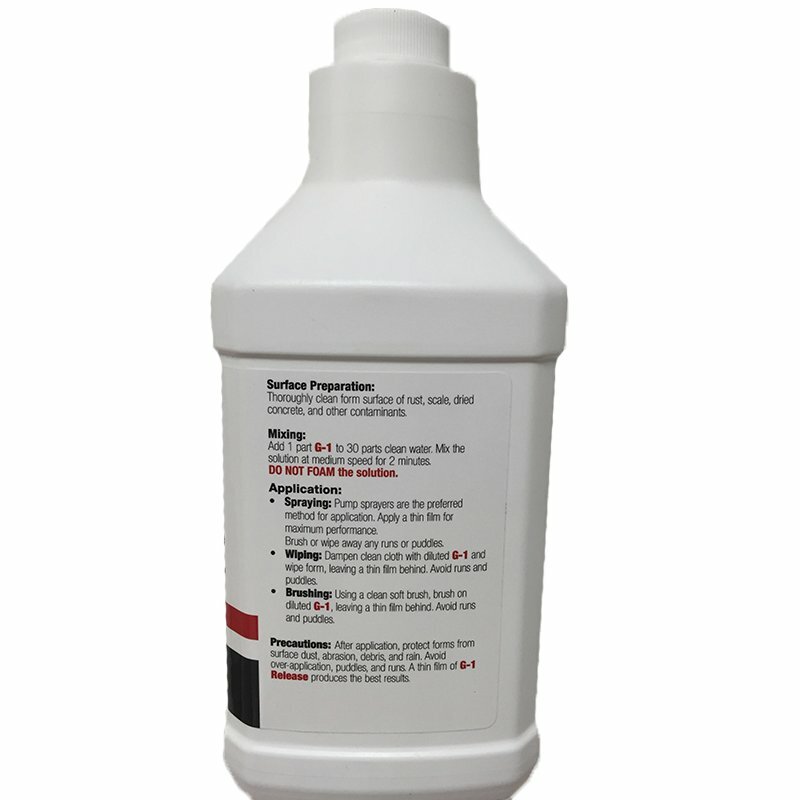 Release Agent provides a clean, positive concrete release and does not interfere with or affect surface detail and helps minimize air bubbles in finished castings. Preparation: Safety - Wear safety glasses to minimize contamination risk. Store and use at room temperature (73°F/23°C). Do not use below 45°F/8°C. Pre-Mixing: Before dispensing, shake container or stir thoroughly with a paddle or drill mixer set on a slow speed to a uniform consistency. Diluting: Concrete Mold Release can be used straight or diluted with 30 parts clean water. The dilution ratio depends on your concrete mix design (amount mixed with water, coverage and frequency of application) will depend on the concrete aggregate mix and the form material you are casting into. For example, when casting concrete with a low grit/high sand content (minimal abrasion) into a polyurethane mold, the mix ratio of water to GlobMarble Concrete Release Agent can be 30 : 1. 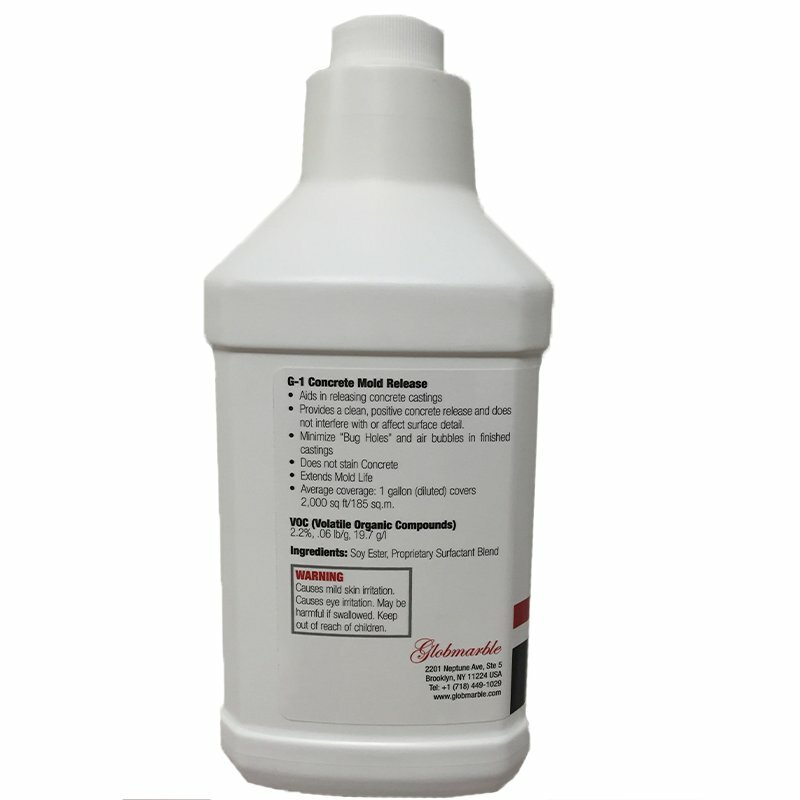 High grit content may call for a dilution ratio of 20 parts water to 1 part release agent. Mix only amount needed for one day. Mixture may separate after 24 hours. Re-mix to a uniform consistency and apply. Mix the solution at medium speed for 2 minutes. Mix only amount needed for one day. Mixture may separate in the container after a few hours. Before dispensing, pre-mix before to a uniform consistency. 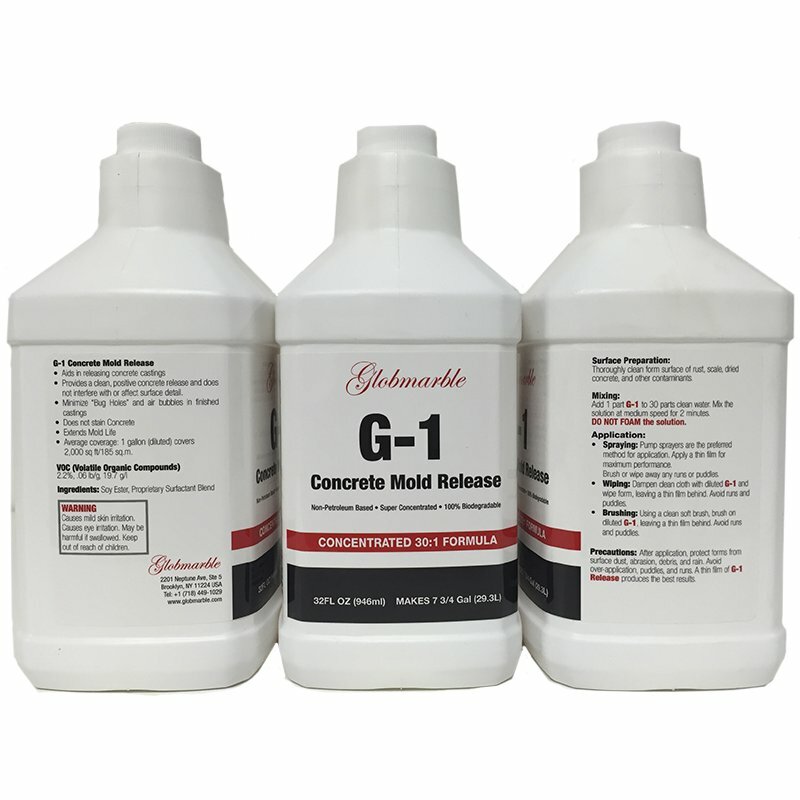 Application: Apply GlobMarble Concrete Release Agent on a mold surface with a brush, roller, HVLP gun or Non-Aerosol Sprayer for G-1 Release with a very thin film (.0005 in / .013 mm). Do not allow release agent to pool in the mold. If release agent applied in excess, the material should be allowed to drain or wipe over mold surface using a clean, soft cloth. Caution: Do Not Over Apply. Applying too much concrete release agent will cause air bubbles “wormtracks”, “bugholes” or pitting on surfaces. After applying release agent to mold surface, you can mix and cast concrete immediately. Mix only amount needed for one day. Mixture may separate after 24 hours. Re-mix to a uniform consistency and apply. Stepping Stone Molds. WS 5002	Mold size 3.87 SQ.FT(0.36 m2) approximate. Measurements - 27 1/2" X 2..
Collomix 8 gallon Heavy Duty Mixing bucket	plastic mixing bucket with metal handle;	8 ga..